Choosing the right worktop can sometimes seem like a daunting task. There’s plenty of variety out there and it’s easy to get lost when making decisions on such a wide range of options. Thankfully this handy guide will make that choice easier, giving you all you need to know about Duropal laminate worktops and the various style, colour and finish choices available to you. Duropal is a world leader in the manufacture of laminate worktops, originally established over 50 years ago. Throughout their history Duropal have been frequent innovators in their industry and continue to thrive as one of the world leaders in the manufacturing of engineered wood and decorative products, including the production of worktops. What are the benefits of choosing a Duropal worktop? The Duropal brand sells itself. They have a long history as a trusted and quality manufacturer of laminate worktops, specialising in their field. They’re the true experts. When you buy from Duropal you can be sure that you’ll be getting a well-crafted worktop that is synonymous with quality and attention to detail. For a worktop that fits both your kitchen and your budget, look no further than Duropal worktops. When it comes to design and current trends, Duropal are at the forefront of all that is in vogue. From slim line, quality worktops to neutral and natural colours, you can be sure that your worktops and kitchen will come together to be the centrepiece of your home. As ever, that the quality of craftsmanship is there with a Duropal worktop. They are manufactured to be easy to clean, are moisture and heat resistant to BS/EN 204 and have a postformed edge that prevents liquid from running off the worktop into drawers and cupboards underneath. This makes them functional as well as beautiful. Whatever your choices, Duropal have you covered. What textures are included in the Duropal worktop range? This surface texture works well in stone reproduction decors, making it particularly versatile. To the touch and the eye, you’d think it was a natural stone surface, but it has the added benefit of the characteristic quality and performance associated with Duropal worktops. It’s currently a firm favourite with customers and perfectly encapsulates trending designs. The gloss finish on this style is not only fashionable, it has the improved abrasion resistance that comes with the enhanced-performance gloss finish. It works well in so many situations although care is needed when installing and using. Like all gloss finishes, scratches can show. The Enhanced Semi Matt finish has a sumptuously natural feel. It’s versatile and pleasant to the touch, making it a popular choice. As always, the high quality performance is assured. It works well in natural and neutral colours and is easy to maintain. The Fine Grain texture is evocative of a natural environment and as such works well when paired with ceramics and stoneware. The softer feel and fine texture make it especially appealing to those looking for a more rustic look. Those creating a bolder look with a more distinctive lines won’t go far wrong with the Rustica style. It looks and feels like brushed wood and has with a gloss-matt effect. It’s currently very much on trend, and without the pronounced wood figures on the surface it has a clean look to it. Perhaps the most versatile surface available, the Top Face looks good wherever it’s placed. It gives customers a blank canvas to play with and is particularly resistant to fingerprints. A classic worktop for a reason. The Top Velvet finish is as elegant and luxurious as its name. The matt, smooth texture has a refined structure to it and fits well in both horizontal and vertical designs. And of course, the usual expected quality is very much there. What textures are on-trend at the moment? The market is ever changing, but currently natural grains and textures that resemble natural stone are the most popular. There is a growing trend for laminate surfaces to look like granite or solid wood, and as the precision and quality of these surfaces increases it is possible to get authentically natural looking textures with all of the benefits of laminate worktops. The rustic look can be perfectly captured without having to compromise on quality. For this very reason, Duropal’s Crystal Stone texture is currently well liked by customers – to the eye and touch you’d be convinced it was a natural stone surface, but functionally it has the added scratch resistance and cleanliness of laminate all with the trusted quality of the Duropal brand. What sizes are available in the Duropal range? Size matters, which is why you’ll find Duropal’s worktops available in 2m and 4.1m lengths, with a width of 600mm. Their worktops are an industry-standard 40mm thick, so you’ll know exactly what you’re getting. 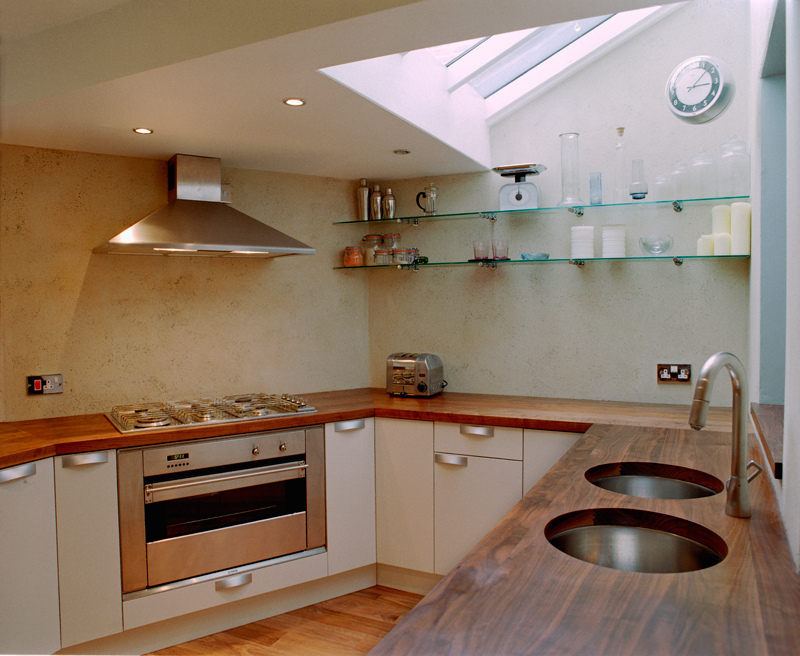 Add natural grain to your kitchen decor with Duropal worktops. If you’re looking for a more slimline worktop to keep in line with current trends though, fear not; the Artis’ range as well as the Bushboard’s Omega, Odyssey and Prima all come in 28mm thickness. If you’re looking to create the sleek, flowing look that’s in vogue right now, you can’t go wrong with any of these. They’re perfect for slimline and minimalist designs that incorporate continuous elegant patterns and detail across surfaces, giving a lighter feel to the worktops. When picking your size, particularly for the longer 4.1m worktops, you can rest assured that every colour in the Duropal range is available in both sizes. This means you don’t have to worry about any unsightly joins across your work surface; you can create a flowing surface in any colour you desire from the range. What accessories are available with Duropal? Making a kitchen the hub of the home is about more than just worktops of course. There is a lot you can do to tailor your workspace to your needs with the accessories that Duropal produce. To get your kitchen perfect, you can accessorise with upstands, splashbacks and breakfast bars, each matched in colour and style to your worktops. All of these can help to make your kitchen a vibrant gathering place for the family and guests. If you’re looking to be on trend, you can’t go far wrong with a breakfast bar and splashback. Whether you’re going for a stylish and modern look or a more rustic one, a splashback offers possibilities for both with the continuation of sleek lines and patterns, or bold natural materials to create an authentic look. What colours are available in the Duropal range? Let your imagination and creativity run wild when planning the colour scheme of your kitchen. The clean, natural designs that are currently so popular can be perfectly captured with the creams, whites and natural wood colours on offer. Duropal is at the forefront of the neutral colours that are ever gaining popularity in contemporary design, where softer colours blend together, occasionally embellished with a flash of brighter colours. Darker blacks, browns and greys are all perfect for those looking for designs inspired by nature, such as the wood and stone look of a farmhouse kitchen. Duropal’s Black Brazil and Black Myriade are great choices if you’re looking for a black worktop. If you want something a little lighter, Duropal’s White Beech Parquet or Grey Ottawa are excellent alternatives. If you are looking to stay on trend, Duropal’s Belluno Granite, Black Limestone, Tuscan Granite or Alhambra all give the effect of natural stone worktops. Our bestselling Duropal worktop is their Natural Sangha Wenge, which resembles natural wood, again perfectly on trend. Now you have the knowledge, why not shop Duropal worktops today?